access to water throughout the school grounds. 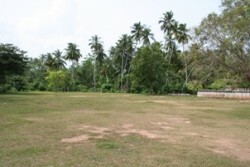 The grounds have been improved to create a multi-purpose sports field. 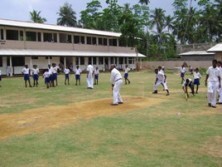 The children can now play cricket, football and netball at the school. Teachers and students alike tell us that is like being in a school in the UK or the US – perhaps not quite but certainly a lot better than before. Since September 2006, Senehasa has had an experienced TEFL teacher and gap year volunteers in place to build an English Development programme. The programme aims to help children learn to speak and use English in everyday life. A better command of English will give these students better prospects in further education and employment after they leave full-time education. 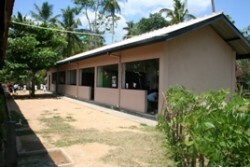 After the Tsunami, Senehasa raised over £150,000 to build new classrooms, a hall and some science labs, enlarge the play area and imrove the overall facilities of Unawatuna Maha Vidyalaya. 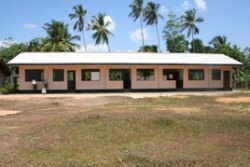 This was needed to accommodate 200 children from Peellagoda School, which was destroyed in the Tsunami. The Peellagoda School, a state primary school, was situated beside the Unawatuna Bay on the sea side of the coastal road from Galle. 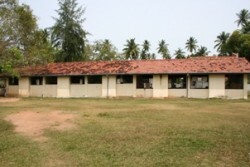 The Peellagoda School will not be rebuilt on the same site. The Education Department decided that the Peellagoda children should be moved to UMV. The UMV headmaster agreed that they can join the school as long as he had an assurance that more classrooms would be built to accommodate the extra children. Senehasa gave this assurance and work began shortly after. UMV is a mixed state school which has children aged 6 to 18 and is located about a two kilometres inland. The school stands on three acres of land. Consequently, there was room to build more classrooms on site. The old science block which was located in the middle of the playground was demolished, increasing the play area available to the larger number of children. Senehasa also sponsor children from UMV. The sponsorship helps them remain in full time education and fulfill their potential. UMV has the potential to provide children from very poor homes with a good education which would give them a more secure future. School also provides solace for these children and offers them a routine which no other part of their lives could offer after the Tsunami. An emphasis was put on completing these projects as quickly as possible to provide the children with stability and hope. Senehasa continues to help the children break out of poverty by on-going support for the school. The Sri Gunarathana Maha Vidyalaya School is situated inland a little behind Ahangama. It has 800 pupils and was used as a centre for Tsunami victims in the immediate aftermath. The school was over-crowded as it has taken in children from schools destroyed by the Tsunami and has a long waiting list of others. The Ratnatunga family was greeted at Sri Gunarathne Maha Vidyalaya (SGV), a school situated in lush green woodland not far from Galle, with an extremely warm and joyful welcome from the staff and pupils. 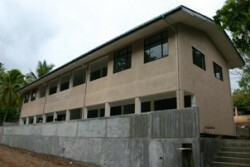 The occasion was the opening of a new building that would accommodate the new students who were forced to move to the school after theirs was destroyed by the Tsunami of 2004. As we stepped out of the vans we were presented with baskets and garlands of flowers. The school band greeted us, resplendent in tartan costumes and playing traditional instruments such as drums and conch-shell horns. They led the procession through the school, with children assembled on either side. We proceeded in this fashion until we reached a small Buddhist shrine in which we placed baskets of sweet-smelling jasmine flowers as an offering. From here we moved on to the building itself, two-storeys housing seven classrooms and the ‘Mini Library’, where we met five monks for the ceremonial part of the visit. As the monks chanted, a small wood fire was made on the floor where some milk was boiled in an earthenware pot until it bubbled over, a Buddhist tradition used to celebrate the beginning of something new. When this was over, we washed our faces in water blessed during the ceremony, and pirith string was tied around our wrists. Then came a series of openings of each new classroom by cutting a ribbon across the threshold. These included speeches from a member from each class made in Sinhala and English. Each room accommodates about 30 children and is equipped with a blackboard, ceiling fans and lights. Unlike our classrooms at home there is no glass in the windows since any breeze is a welcome relief from the heat. After refreshments of traditional Sri Lankan dishes including Kiribath (milk rice) and Kaong, small juggery cakes served with strong black tea, we went to the hall which was full to the brim with small children, parents and teachers. 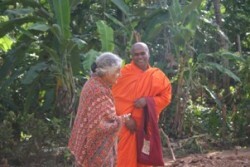 Here we heard speeches in Sinhala and English from various staff including the headmaster, his deputy and the priest. These were interspersed with traditional dances and performances by the school choir. Throughout, the staff and pupils thanked Senahasa Trust, Senehasa Association and World Jewish Aid for its work and help in the school, and the ceremony was capped off with a presentation of small engraved silver trays in the shape of the island. As we drove away we were left with the memory of happy, waving children and a warm and friendly place that we would hope to return to one day soon. Senehasa has built a new classroom block and refurbished a damaged building at Tittagalla School – our third school in the Galle District. Tittagalla East is a small rural community 16km from Galle. Many of the fishermen and their families were affected by the Tsunami, having lost their homes and livelihoods. Tittagalla has over 100 children from aged between 6 – 11 years old. Classrooms were overcrowded and makeshift: many were not partitioned but held up to four classes simultaneously, making it very difficult for the children to concentrate. 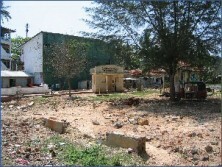 After the 2004 Tsunami, a new housing project was located next to the school, bringing garment factory workers and their families to the area. This in turn brings additional children to the school. New and improved facilities were desperately needed. Senehasa has already built a pre-school for the community and so the focus moved on to the older children. The school is now making good use of its new facilities, and Senehasa plans to continue its support in the long term. Gap year volunteers teach English and games classes at the school and the standard of English has improved significantly. Senehasa also organises a daily milk programme which involves a rota of mothers preparing the milk for the children. This daily sustenance helps the children concentrate at school. 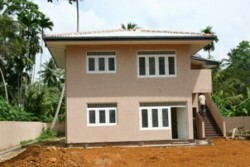 Work has been completed on our fourth state school in Galle District. 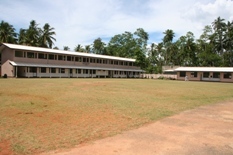 Mihiripenna School was used as a camp for Tsunami survivors and many children lost family and their homes. It has since taken in many children from other schools which were destroyed. The classes were cramped and the buildings damaged. We built new classrooms, refurbishing old buildings, and improving the playing fields that quickly become waterlogged when the rains came. 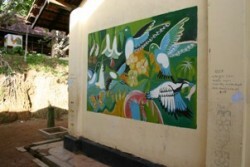 Mihiripenna Maha Vidyalaya is a small rural school about 10 km from Galle. The school has students from 6-16 years (Grade 1-12). More than 125 children at the school were badly affected by the Tsunami – twelve lost their parents and most lost their homes. Mihiripenna Maha Vidyalaya initially took on 60 children from coastal schools destroyed by the Tsunami and had 326 students. In 2007 the school has taken on further students with the student body rising to over 480 with class sizes of 40 plus. Repair some of the old buildings which were in a poor state, made worse by the use of the premises as a crammed Tsunami shelter in the first three months following the Tsunami. The roof leaked and the students got wet during the rains. This particularly affected the primary children. Refurbishing the old buildings -Rubbish fell through the roof into the classrooms. The rooms need to have proper ceilings. Seven classrooms did not have electricity including the primary and the English room. The wiring was unsafe throughout the school and needed to be replaced.